Toyohara Kunichika (1835-1900) Snow, Moon and Flower: Nakamura Shikan with a "namazu" (Catfish) dancing before him, 1866. Oban. 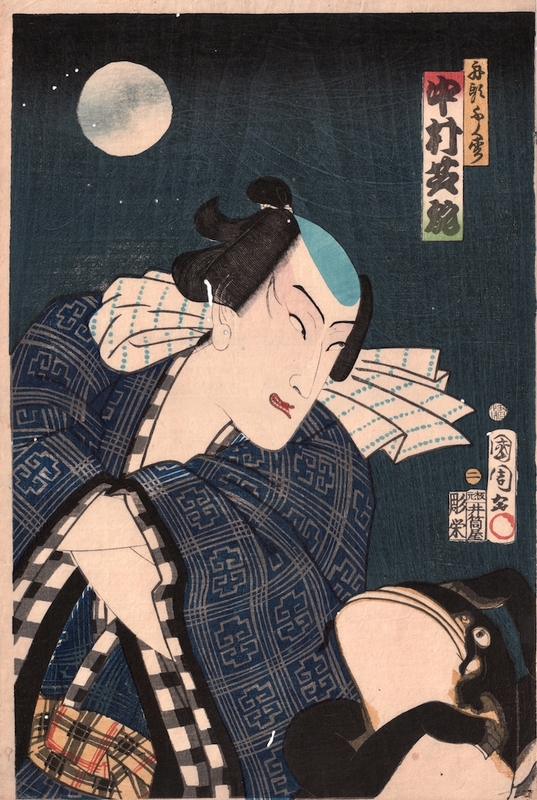 This print shows the great kabuki actor Nakamura Shikan and a catfish. The print may not commemorate a specific performance; "Snow, Moon and Flowers" was a subject that was immensely popular in Edo Japan. The threefold theme (in Japan, flowers almost always mean cherry blossoms) refers to the seasons of the year: snow in winter, moon in autumn and flowers in spring. It also held other allusions or mitate as in this case where the artist is tying the melancholy autumn moon with the devastation wreaked by the catfish or, namazu. The earthquake fish or NAMAZU or JISHINUWO. This is the catfish to which earthquakes are due; the creature has a body like an eel, a large flattened head, and long feelers on both sides of its mouth, it lies with its tail under the provinces of Shimosa and Hidachi, and when angry, wriggles about, shaking the foundations of Japan. A large stone rests on its back, the Kaname Ishi, protruding in the garden of the temple of the God KASHIMA DAIMIOJIN (Takemika Tsuchino Mikoto). This stone goes deep into the bowels of the earth, it is the rivet (Kaname) which binds the world together: when KASHIMA and KADORI MIOJIN came from Heaven to subdue the world, Kashima thrust his sword through the earth, the mighty blade shrank and became the Kaname Ishi which Kashima alone can move. Kadori Miojinis Futsu Nuchino Mikoto, he has a gourd, and with that gourd and the help of Kadori, this God keeps the fish quiet. Mitsukuni, Daimio of Mito, grandson of Tokugawa leyasu, with a Saint Thomas bent of mind, had the earth dug around the Kaname Ishi, but his men could not get at the base of it. Kadori and his gourd, hugging the Namazu, is sometimes a subject for artistic treatment. His efforts are little thought of if one believes the proverbial sentence : A Gourd against a Namazu, (meaning useless effort) alluding to the slipping of the gourd on the fish's skin. This is a very nice print by Kunichika. 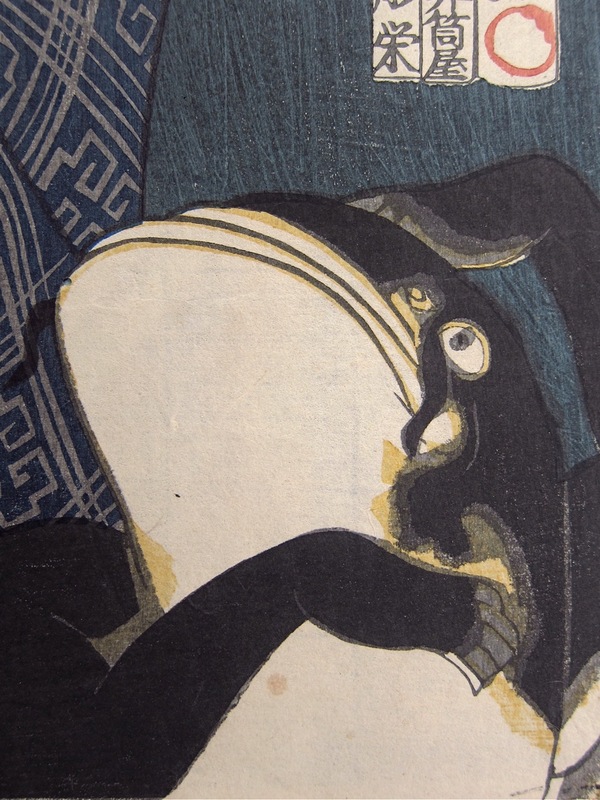 Namazu-e, or Catfish-Prints, are a highly collectible niche in their own right. This unusual print, similar to a copy in Tokyo Metropolitan Library, seems nevertheless to be unrecorded. The wood grain in the background is fresh and very pronounced. Image full size, without margins. Very good impression, colour is fine and the impression is excellent.